The European Commons Assembly (ECA) is a network of grassroots initiatives promoting commons management practices at the European level. 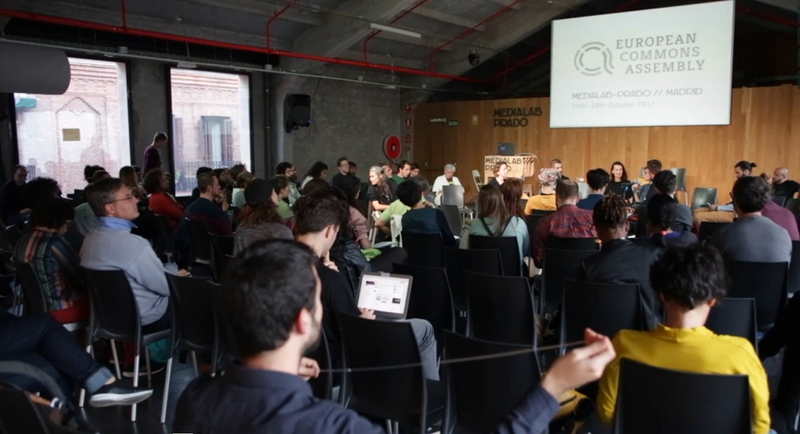 The last stop for the network was at Medialab Prado, Madrid. These activities were part of the Festival Transeuropa program, a large meeting of political, social and environmental alternatives. Commons and democracy are intimately linked. This workshop addresses civic participation and ways to foster citizens’ involvement in the production of their cities through engagement with public bodies and direct forms of political action. The workshop will take into account how regulations and policies on open source and open data, on the one hand, and those on technology and decentralized infrastructure, on the other, can play a role in facilitating data sovereignty and new forms of local cooperativism. Moving away from large corporation and capital-led city development, we have to rethink the Smart City model and imagine data commons that socialise the value of data. How do initiatives like guifinet and Fairbnb fit in? The starting point for the workshop will be recent experiences in Barcelona and Amsterdam. Participants have experience and are interested in the interrelationship at all points of the journey from “Land to Fork”, including access to land, nutrition, food sovereignty, cultivation, etc. ; new forms of distribution, including for recycling; access to medical knowledge and patient-guided health policies and services; democratization of healthcare and self-organization of citizen efforts to reduce bureaucratic hurdles; and reclaiming the field for grassroots sports while challenging norms to inspire new models of recreation. These include participants’ experiences in, for example, production of municipal regulations for shared administration, which protects urban commons (squares, gardens, schools, cultural commons, streets, etc.) and compels local governments to collaborate with citizens. Participants propose the generation of platforms to exchange existing knowledge and experiences in legal mechanisms, as well as the production of practical tools to be used at European and local levels in relation with legislation, norms and institutional interaction.